Like its sister program, Illustrator, Photoshop is used primarily to create artwork to be placed in a layout created with a Desktop Publishing application. As with Illustrator, Photoshop lacks certain prepress tools necessary for output to high end imagesetters and gives the user little control over page setup options. We recommend submitting files created in Photoshop as a flattened .tif placed in a QuarkXpress, InDesign or Microsoft Publisher file. This will allow you so set the image's exact size and placement on the page as well as define bleeds and other settings you feel are necessary for the proper output of your file. 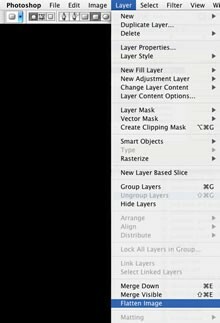 Stand-alone Photoshop files may incur additional charges if settings such as these need to be made.If it is necessary to retain Photoshop's layers to keep vector or text settings, InDesign will allow you to "place" the file in its native format. Several third party plug-ins for QuarkXpress will allow you to do this as well. When submitting layered Photoshop files with vector text information, it is critical that all fonts used in the file be included so that output is of the highest quality. Disclaimer: All information deemed reliable but not guaranteed and should be independently verified. Neither Press Express, nor By Request Web Designs, shall be responsible for any typographical errors, misinformation, or misprints.